Mane Imports, LLC was created out of Jasmin Becker’s love of horses. 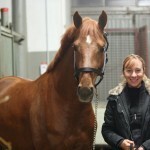 An equestrian her entire life, Jasmin established Mane Imports in early 2000. We are proud to present a unique website that serves the equestrian community by offering the best horses for sale in the United States and Europe. Our web site offers information on how to purchase a horse overseas and provides videos and pictures for our clients review. Since early 2000 we have been working directly with sellers to provide the lowest prices for our clients, as well as give our clients piece of mind that they are purchasing safe and sound horses. We will be happy to give you a list of references. The web site also gives our clients information on Jasmin Becker’s training background and Training articles. Jasmin is available for lessons and clinics. Please browse our site, enjoy the pictures and video, and contact us with any questions or comments. If you are interested in receiving our e-newsletter we will be happy to keep you informed about upcoming events and equestrian news.